(Inside Science) -- Manta rays soaring through the oceans may capture prey using filters that repel food rather than entrap it. This newfound mechanism, unlike any previously known filtering technique, could lead to new ways to clean water of microscopic pollutants that pose risks to both people and the environment. Mantas are the largest rays in the world -- one recorded specimen had a wingspan of 9.1 meters (almost 30 feet). Despite their size, mantas are harmless to humans, feeding instead on plankton and microscopic crustaceans in open waters. They swim with their mouths open, catching food while simultaneously expelling seawater out their gill slits. Many other animals, like oysters and humpback whales, feed by filtering food out of the water. Oysters rely on the sticky mucus of their gills to glom onto food, while humpback whales swallow clusters of fish and then use jaw structures known as baleen to sieve out seawater. Previous research suggested that mantas also sieve their food, using structures known as gill rakers. However, when study co-author Misty Paig-Tran, a marine biologist and biomechanist at California State University, Fullerton, watched mantas feed, she found they only closed their mouths and swallowed every few minutes, and did not seem to have a way to clear their gill rakers of food. "Which, at least to me, didn't seem like sieving, since you would expect the filter to clog really fast," she said. Analyzing how live mantas feed is tricky, because "mantas are really fast-swimming animals, and it is difficult to film inside their mouths," Paig-Tran said. Instead, she and her colleagues experimented with 3D-printed models of the filtering apparatus of the giant oceanic manta ray (Manta birostris) that they built based on specimens borrowed from museum collections. The scientists placed their models in tanks filled with blue dye and brine shrimp eggs that flowed at velocities the researchers estimated that manta ray gill rakers would encounter based on the swimming speeds and anatomical features of the fish. They next used video cameras and computational fluid dynamics software to monitor how the dye and eggs moved. The gill rakers of manta rays are made up of long parallel arrays of leaf-like filter lobes. "The anatomy of a manta filter is unlike any I have ever seen before," Paig-Tran said. The scientists found that as water flowed over these filter lobes, large vortexes appeared within the pores of the lobes. The brine shrimp eggs, mimicking the behavior of any plankton suspended in the water, then essentially "ricocheted" away from the filter apparatus, recoiling toward where the manta ray throat is located. "Although filter-feeding fish are approximately 25 percent of the world's fish catch, we know very little about how these fish obtain their own food," said biologist Laurie Sanderson at the College of William & Mary in Williamsburg, Virginia, who did not participate in this study. "To explore the 'black box' of manta ray mouths, this research has applied multiple techniques that are state-of-the-art." This novel mechanism, dubbed ricochet separation, does not resemble any previously described filtration system. "This is a great example of evolution honing animal performance with surprising innovations, taking advantage of physical principles in ways that engineers haven't even developed yet," said marine ecologist Jeff Shimeta at the Royal Melbourne Institute of Technology in Australia, who did not take part in this research. The fact that ricochet separation is non-clogging could have major industrial applications, the researchers said. Filtering technologies, from the mesh filter in many air conditioners to the water filters affixed to many faucets, usually rely on either sticky elements or sieves, but often clog, making them costly and time-consuming to clean. "The filtration mechanism in mantas is exciting because particles bounce off of the filter, so the filter stays clean and maintains high flow rates," said study co-author James Strother, a theoretical biologist at Oregon State University in Corvallis. The scientists are currently exploring whether ricochet separation could extract microscopic pieces of plastic from wastewater. When such "microplastics" enter the food chain, they could be potentially harmful to both wildlife and humans. 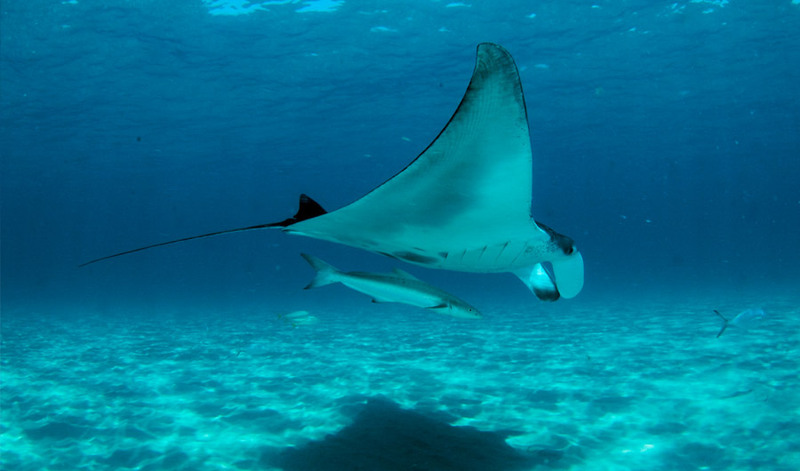 "Filtering out microplastics is a major engineering challenge, and the high flow rates and resistance to clogging we observed in manta ray filters could be really advantageous," Strother said. In addition, these findings may help conserve mantas and their relatives the mobulas. "Knowing what an animal is eating helps us to protect areas where they will likely be feeding," Paig-Tran said. Further studies could reveal if the manta ray's filtration mechanism plays a part in determining what prey they capture, explained Shimeta. "These findings also suggest that gill rakers of other fish species should be examined more carefully for surprising filtration mechanisms." All in all, these findings emphasize that "funding basic research is important. Eleven years ago, when I started this research, I could not have predicted this would lead to a new non-clogging filter," Paig-Tran said. "You just never know when observations of nature will turn into a usable application for humans." In the future, the scientists also hope to see ricochet separation happen within real mantas. "Believe me, I have tried," Paig-Tran said. "I think I have figured out a good way to get these data in a live manta without harassing it, so hopefully that will be forthcoming." Paig-Tran and Strother, along with study lead author Raj Divi, detailed their findings online Sept. 26 in the journal Science Advances.